Global Warming? MAN MADE?! NOT!!! THE U.S. E.P.A. is LYING TO YOU! According to RADICAL environmentalists world-wide, the CO2 produced by the use of fossil fuels is producing enough carbon dioxide "emissions" to create a shift in the global climate, significant enough to cause problems with the environment, melting of the polar ice caps, and eventually, our extinction. But their so-called "research" is based on flawed logic. Not only does it assume that MAN MADE CO2 is "the problem" it also assumes that CO2 is the ONLY so-called "greenhouse gas" on the planet, AND that man-made CO2 is the primary driving force for "global climate change". Of course, anyone with basic high school chemistry and general science knowledge should be able to see that this is completely ridiculous. Still, for the sake of argument, I'll begin by demonstrating that CO2 levels are NOT causing global warming because of any specific human activity (particularly the kind of activity that burns fossil fuels). Then I shall demonstrate that CO2 is NOT the primary 'greenhouse gas', thus demonstrating that focusing on CO2 is really, really narrow-minded (if not just simply 'clueless'). And finally I'll demonstrate a possible model for showing how and why solar cycles happen, and why we are currently in a 'maximum output' period. And if that's not enough for you, I've even proposed a possible motivation for the "Global Climate Change" hoax, and who it is that would benefit from the use 'Global Warming' for political and/or economic purposes. Do you ALSO see how the USA just is NOT putting out that much CO2 when compared to THE AMAZON JUNGLE? Oh, sure, the article tries to explain it away, like 'brush fires' or something. But consider this: BRUSH FIRES must generate a ZILLION times as much CO2 as the USA. So WHY blame the USA for "Global Climate Change"? FirstNext, I'll bore you with some simple calculations, which you can repeat yourself. Feel free to report any errors to me so that I can correct them. I once did an experiment in which I held my breath for approximately 1 minute, and using an exhaust gas analyzer, I measured the percent O2 in my exhaled breath. I discovered that after holding my breath for a minute, the percent oxygen was approximately 10%, less than half of normal (20.9%). I did this to see how efficient my lungs were at extracting oxygen from the air. I found that I could get it as low as 5% if I held my breath long enough, but below that I had some trouble holding my breath. Because I was "at rest" when I did this, it is a good representation of the amount of oxygen that I consume on average, while "at rest". For sake of calculations, we must assume that every molecule of Oxygen inhaled and metabolized by your body produces one molecule of CO2. By mass ratio, this is 44 grams CO2 per 32 grams O2. Volumetrically, this is 44 grams for every 22.4 liters (1 mole gas at STP) of pure oxygen. At 2.2 lbs per KG, that's equal to 0.66 lbs per day. NOW, using this information, and extrapolating out the entire population of the world, roughly 5 billion people, we have approximately 3.3 billion lbs of CO2 generated per day by people exhaling, or 3.3 billion lbs per day of CO2. OK, so I admit that my car DOES put out CO2, but it's a LOT better than CO or HC emissions. So what are the wacky environmentalist extremists whining about NOW? Well it seems that THEY think that my car is putting out too MUCH of the same gas that every human on the planet is exhaling right now. So let's see JUST how much CO2 I "pollute" the environment with. With the assumption that 1 gallon of gasoline (roughly 6 lbs) burns completely, and thereby produces approximately 1 molecule CO2 for every atom of carbon, AND assuming that gasoline is a PURE hydrocarbon compound, with very few double bonds between carbon atoms, the mass of gasoline will be approximately 14 grams for every 12 grams of carbon. Ideal gasoline for '100 octane' measurements is 1,1, dimethyl-hexane, which has 8 carbons, and 18 hydrogens, which is very very close to this ratio. Adding oxygenate may alter this slightly, but in a direction that REDUCES the result of the calculation. = ~19 lbs CO2 per gallon of gasoline. 500 million * 19 lbs = 9.5 billion lbs CO2 per day. For the sake of comparison, this is approximately 3 times the amount breathed by humans AT REST. Assuming that all of these cars are being driven this much, the amount of CO2 "exhaled" by cars is three times that of all of the humans on the planet. According to this document, automobiles in the United States are producing 1,455 Tg of alleged "greenhouse gasses" per year. based on calculations for the year 2000. Per day, this would be ~8 x 10^9 (8 billion) lbs of CO2 from cars in the United States alone. Based upon THIS figure, how many gallons is that? With 19 lbs of CO2 per gallon, you can easily calculate that to be 420 million gallons per DAY. That's 420 million. >1 gallon of gasoline per day for every person in the United States. Now, that assumes that people of "driving age" that aren't retired, or disabled [roughly half the population], are driving an AVERAGE of 20,000 miles per year, each. EACH! For a 5 day work week, this would be an average commute of between 70 and 75 miles (round trip - 35 miles each way, probably over an hours' driving in traffic each way) for every 'working person', plus additional miles for trips to the store, trips to the soccer field, and so on. And most of the cars people commute in have reasonable 'traffic mileage', with very few S.U.V. 's and trucks, because at $1.50+ per gallon, people just can't afford to pay >$50 per week for gasoline for each car that is used for commuting. And, using these figures, for a 5 year period, the "life" of a car of 100,000 miles would quickly be exceeded, and that would scare the financial companies something fierce. At best, I would think it would be less than HALF of that. Needless to say it seems to me that an exaggeration of facts has taken place by the EPA, and I'd like to see where they get THEIR numbers from. If the concentration of oceanic CO2 increases, sedimentation and algea will deplete it. Being at equilibrium, a change in one side of the 'balance' causes a shift in the other side of the 'balance', thus maintaining a relatively constant atmospheric concentration over time. But chemical equilibrium isn't the ONLY thing keeping the CO2 levels stable. There is also BIOLOGICAL EQUILIBRIUM. Plants will grow FASTER if you increase the CO2 concentration, and proportionally will DEPLETE THE CO2 FASTER whenever there is MORE OF IT in the atmosphere. If you don't believe me, you might want to read about that sort of thing HERE. Suffice it to say that every farmer on the planet should be VERY happy if the CO2 concentrations are being increased. BUT, as we know, the wacky environmentalist extremists would have us think that even a SMALL change in the amount of CO2 produced by car exhausts (and power plants and anything else that uses fossil fuel) would have a LARGE change on atmospheric concentrations, and would continue to RISE INDEFINITELY without the depletion rate being affected by the higher CO2 concentration, and thus it would take "hundreds of years" to get back to 'normal levels'. SOME warmists think it will take even longer! But the truth is more reasonable. Volcanic activity (which does increase CO2 levels) has a FAR greater effect than all of the cars and power plants combined, because volcanic activity recycles the sedimentary carbonates back into the ocean, and the warmer water in the vicinity of the volcano causes it to 'give up' some of the precipitate CO2 as 'effervescence'. It's a bit like when a soda goes flat as it gets warm. But were it NOT for the volcanic activity under the oceans, the CO2 levels would be LOWER THAN THEY ARE NOW, due to the CONSTANT formation of carbonate as precipitates, and there wouldn't be NEARLY enough CO2 for all of the plants. We should all be VERY happy that the underwater volcanos are making enough CO2, or we'd all starve to death. Basic chemistry shows that the Hydrogen Carbonate and Carbonate ions (formed by CO2 reacting with water) are both relatively insoluble with MOST metal ions, except for Group I metals. Solubility forms an equilibrium in which SOME of the ion concentration (below the equilibrium constant) will remain in the solution. For more information on carbonates, you can go HERE, but be careful to avoid any 'warmist propoganda' it might lead you to. So what exactly WOULD happen if underwater volcanos stopped erupting? A decrease in underwater volcanic activity would cause more carbonate residue to form on the ocean floor. As rain hydrolizes carbon dioxide from the atmosphere, it deposits it into bodies of water (like the ocean). Carbonate precipitate then forms, causing the concentration of oceanic carbon dioxide to drop. Since the amount of dissolved gas that can be at equilibrium with the ocean is a constant based on temperature, less carbon dioxide is released back into the atmosphere (as part of that equilibrium), and so the carbon dioxide becomes 'trapped' in the ocean as carbonates. Underwater volcanos, however, would stir up (and warm) this precipitate, and cause ADDITIONAL carbon dioxide to be released into the atmosphere. A reduction in the volcanic activity would therefore REDUCE the carbon dioxide naturally released back into the atmosphere from the ocean (at equilibrium). Then, as the atmospheric carbon dioxide levels drop, less carbon dioxide is depleted by the rain. As the rain dumps less carbon dioxide into the ocean, oceanic carbon dioxide levels drop, causing less precipitation of carbonate residue, and a new (lower) equilibrium concentration of dissolved carbon dioxide is established in sea water. As a result of the lower carbon dioxide levels, algea growth diminishes somewhat, producing less oxygen. Similarly, plant growth on the earth's surface would be reduced slightly, also producing less oxygen. A shift in worldwide oxygen production would cause an effective increase in carbon dioxide levels in the ocean from animal respiration, and to some extent, in the atmosphere. You can add man-made sources to the production if you like. The fact remains that depletion rate is now lower due to the lower concentration of carbon dioxide. Eventually, a new equilibrium level is reached where carbon dioxide levels in the atmosphere may be immeasureably lower than they were before, but not significant enough to cause global warming/cooling. Carbon dioxide levels in the ocean would be measurably lower, but total dissolved gas concentration would remain roughly the same. Oceanic animals breathing the slightly higher concentrations of oxygen may actually flourish a bit more than usual, which would actually cause an increase in the production of CO2. A new "biological equilibrium" would be reached in the oceans. And despite what anybody wants to admit in the wacky environmentalist camp, the same kind of analysis applies when CO2 levels are INCREASED due to car exhaust and power plants and human activity in general, or horse and composting activity (if we abandon cars and go 'natural' in our farming), or there is an increase in the population of all of the animals on the planet for that matter. Whatever the cause, an increase in production rate of carbon dioxide WILL result in all major depletion factors SHIFTING IN THE DIRECTION of DEPLETING THE CARBON DIOXIDE FASTER, no matter HOW MUCH the warmists claim otherwise. Of course, if our world's carbon dioxide cycle were UNSTABLE, and not at equilibrium, even a slight change (such as an increase over time of the population of humans and animals, or a gigantic forest fire) would have had a DRASTIC effect on our global climate, forcing us to radically bounce from ice age to searing heat and drought, flooding of the coastal lands by repeated cycles of melted polar caps, and all of the other disastrous climactic images you can think of. But we know that the earth's climate has been "at equilibrium" since the previous ice age, which was probably caused by an asteroid or comet hitting the earth. It's something we can NOW prevent ourselves, given enough warning. As I find more interesting web sites I'll add them here. The Climate Realists site, including Gary Novak who has an Interesting Paper on CO2. John Coleman, weatherman for KUSI and co-founder of The Weather Channel, said THIS on Fox News. Yep. 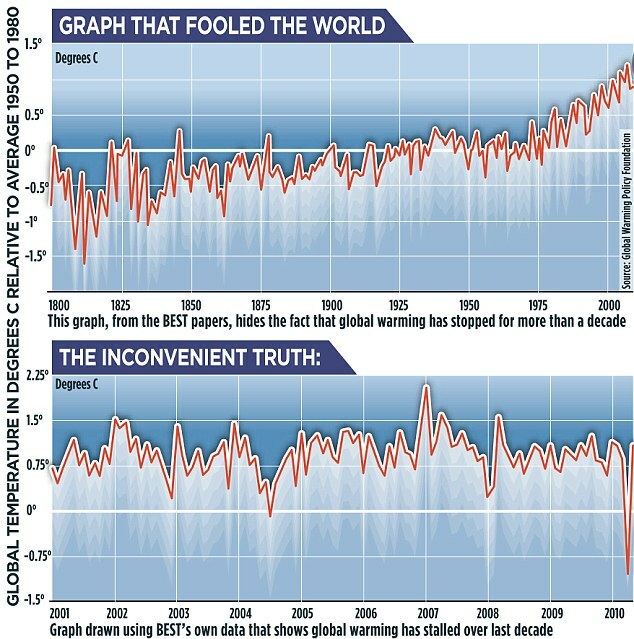 In case you were wondering, THE WARMISTS "NEVER" FALSIFY THEIR DATA. Yeah, no sarcasm here, right? Calls 'global warming' "the greatest and most successful pseudoscientific fraud I have seen"
As for my opinion, I think the 'Global Warming' crowd is BOTH evil AND wrong. But that's me. NASA confirms CO2 biological equilibrium just like I illustrated above, YEARS AGO! On, and they also said that doubling CO2 would only cause a SMALL change in temperature. Definitely NOT a global disaster! 2012 Temperatures are NOT INCREASING! In fact, they're starting to go DOWN. Good thing that CO2 levels are INCREASING in spite of all of the hype, because THAT way the 'warmists' can't take credit when temps drop significantly, like maybe in 2013? Someone honestly wrote an e-mail to me, and I believe it epitomizes what most people on the 'global warming' side of the argument believe. Rather than criticize it point by point (I don't really need to make people into targets like that), I'll simply quote it 'as-is' and summarize my response. Your argument regarding global warming is somewhat flawed. look into all of this yourself, I'm not trying to deceive you. Basically, it condescendingly follows the oversimplified assumption that the depletion rate of CO2 remains constant, regardless of changes in the production rate. Yet it can easily be demonstrated that very SMALL concentration changes of CO2 in the atmosphere will cause a significantly HIGHER amount of CO2 to be depleted by rain, due to the equilibrium constant for CO2 forming carbonic acid in rainwater. 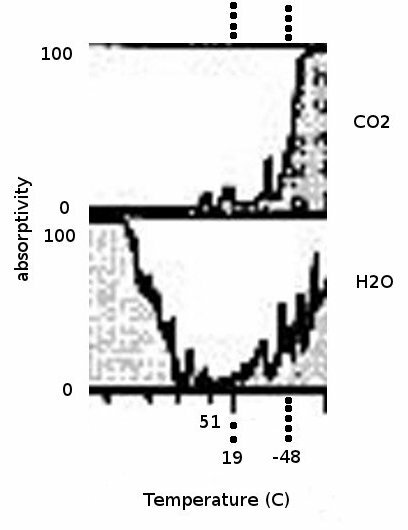 A small change in either side of the equation (depletion rate or production rate) results in a shift towards the equilibrium concentration of CO2. Following this, CO2 is then depleted within the ocean by precipitation of carbonates. Also keep in mind that MOST of the world's CO2 already exists in the ocean, AND if there were no undersea volcanos, nearly ALL of the world's CO2 would be trapped there. Instead, undersea volcanos stir up the carbonates, and effervesce the CO2 back into the atmosphere. So a much larger factor on CO2 concentration in the atmosphere (as well as any 'global warming' effects it might cause) would be the presence (or absence) of undersea volcanos. The different in magnitude of scale should have people more concerned about volcanos, rather than the burning of fossil fuels. And there has been a little more volcanic activity recently, off the coast of California. Thinking of VOLCANIC ACTIVITY, check out the activity on Antarctica! When warmists claim that ice sheets are SLIDING INTO THE OCEAN because of CO2 warming the planet, consider what the VOLCANOS might be causing, and THAT INCLUDES WARMER CLIMATES AROUND THE ANTARCTIC CONTINENT! Remember, a SINGLE VOLCANO can do FAR MORE than ANYTHING that humans are capable of doing when it comes to warming, greenhouse gasses, and overall destruction. Anyone familiar with Mt. Pinatubo or Mt. St. Helens or (gasp) Mt. VESUVIUS (as in the destruction of Pompeii way back in history) should realize this, without any possible argument whatsoever. As it turns out, CO2 (which has a very SMALL concentration in the earth's atmosphere) is NOT the 'biggest greenhouse gas on the planet'. Strangely coincidental with what I believe is the agenda of the 'global warming' crowd (to restrict the use of energy by the common folk and reserve it only for the elite) the minor effect of CO2 has the hyperfocus microscope trained upon it, while simultaneously ignoring the 'elephant sized' contributor known as WATER, something that human beings aren't affecting in the least. Any grade-school aged child above the age of 9 understands the basic hydrological cycle that takes place on our planet, and has been taking place for a few million years (since the 'big cool down'). But as Jeff Foxworthy has pointed out from time to time, the average adult is probably dumber than the smartest 10 year old when it comes to science (and just about everything else). Do I really need to explain to everyone how water evaporates, forms clouds, and rains back to earth? Well, I did make reference to it earlier, as the major depletion factor for atmospheric CO2. I had hoped that everyone would understand this kind of common sense. NOTE: Original link broken. An earlier link to a more complete chart could be found HERE (except that it's broken, too). However, THIS link seems to be working, and has a lot more interesting information, and has been around since 2010. If it ever breaks, I'll link it through the internet archive. There's also a nice reference for the chart's source on that page, "J.N. Howard, 1959: Proc. I.R.E. 47, 1459" and "G.D. Robinson, 1951: Quart. J. Roy. Meteorol. Soc. 77, 153". However, it has a very SIMILAR appearance to the one I'm using, and therefore I think it helps some with the credibility, if anyone asks "where did you get your numbers". What is clearly obvious to me (and hopefully to you as well) is that CO2 doesn't absorb NEARLY as much of the IR spectrum, nor the UV spectrum, as does water. What is even MORE important is that water absorbs much LOWER IR FREQUENCIES than does CO2, which means that lower earth temperatures, radiating lower IR frequencies out into space, will get a 'greenhouse effect' from the presence of WATER in the atmosphere, but NOTHING from CO2. So it should be pretty obvious that the effect of changes in concentration of CO2 in the atmosphere is dwarfed by comparison to the effect of changes in concentration of water in the atmosphere, and we ALL KNOW that water concentration changes from day to day, hour to hour, in amounts FAR GREATER than that of CO2, and the planet has NOT gone into a spiraling global warming or global cooling situation as a direct result of it!!! Now I know that someone's going to point out that there is 'complete absorption' of all infrared radiation by CO2 above 13 microns, and I do not disagree with this at all. But you should keep in mind that 13 microns corresponds with a temperature that's LOWER than anything found on Earth, with the exception of Chicago or Alaska or Antarctica at certain times during the winter. The formula of the PEAK IR wavelength (in microns) to temperature (in degrees K) is about 2900 / wavelength. For 13 microns, this would be about 223 deg K or -50 deg C, or -58 deg F. So next time the temperature gets down THAT far, maybe in Alaska or Chicago or Antarctica, you can thank all of that CO2 that it doesn't get any freaking COLDER. But keeping all of the heat in is OBVIOUSLY the job of WATER and OXYGEN, which traps all of the higher energy photons, and not just the wimpy ones that are trapped by CO2. Like I said, CO2 does absorb IR. It's just that H2O absorbs WAY MORE, and is FAR MORE SIGNIFICANT than CO2. And I would call THAT "the smoking gun" as far as the debate goes. Oh, yeah, it's worth pointing out that the above chart wasn't the ONLY reference I found on this subject. It was merely the one that best illustrated my point. 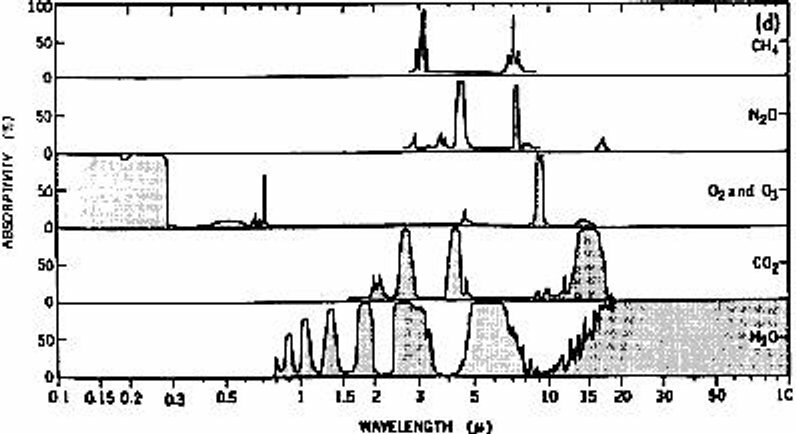 One nice explanation of CO2 absorption lines can be found HERE. On the right you can see a closeup of the CO2 and H2O portions of the above chart. Zooming in you'll notice that CO2's peak is just BELOW -48 C, which is (again) -58 F. The '10 micron' line corresponds to 17 C, or about 63 F. What can clearly be seen here is the amount of IR energy that is absorbed by water at temperatures above freezing (I would expect water vapor concentrations to be VERY LOW below freezing) with a small 'peak' right around the freezing point. Considering that there is typically several HUNDRED times as much water in the atmosphere as there is CO2, it becomes pretty obvious that the absorption of IR energy by CO2 is INSIGNIFICANT when compared to the absorption of IR energy by WATER with IR energy corresponding to temperatures that are WITHIN THE TYPICAL TEMPERATURE RANGE OF THE PLANET. Now, you might argue that IR emissions include a wide spectrum of energies, and you would be right. But when you look at how much the temperature will change when IR of a particular energy is absorbed, it's pretty obvious that HIGHER ENERGIES (shorter wavelengths) matter MORE than LOWER ENERGIES (longer wavelengths). And, the energy per photon is ALSO higher for shorter wavelengths. The probability that a photon will be absorbed is a function of its energy and the 'macroscopic cross section for absorption' of the material. That last nine-dollar phrase is a function of the 'microscopic cross section' (a known factor) and the concentration times the physical distance through which the photon must pass. Think of it as a marble going through a circle with either LOTS of marbles in it (high probability of interaction) or only 1 marble in it (low probability of interaction). So from these charts, the RELATIVE ABSORPTION of a particular energy of photon will not only depend on its energy (for that specific gas) but ALSO ITS CONCENTRATION WITHIN THE ATMOSPHERE. Extending this, consider that water can be up to 2 percent of the atmosphere, particularly in hot, humid areas. CO2, however, is typically only 0.04% of the atmosphere. If the average amount of water in the atmosphere were only 0.4% (relatively dry throughout the world, if you compare it against THIS chart), it's still 10 times the concentration of CO2, and can be as much as 50 times the concentration of CO2. THEN, compare the total amount of RELEVANT IR ENERGY that water absorbs as compared to CO2, and it's pretty obvious which one is the "better" greenhouse gas. And, consider that cloud cover during the day can drop temperature by 10's of degrees F, and cloud cover at night can RAISE it by a similarly high amount (though not QUITE as much as the daytime effect). It's OBVIOUS that WATER makes a HUGE DIFFERENCE on the climate. And it's OBVIOUS that the MINUTE levels of CO2 being put into the atmosphere by human activity, by comparison, is NOTHING. NOTHING. It's like, drop in a bucket, which is (basically) NOTHING AT ALL. ZERO, ZIP, NADA. UNMEASURABLE. NO EFFECT. A fly on the scale when you weigh yourself. NO difference. I have seen at least ONE source attempt to discredit the idea that water vapor has many times the effect of CO2 on global climate. They allude that some kind of 'cycle' exists that somehow amplifies changes in CO2 using water. They are so full of themselves that it is pathetic. Water ABSORBS CO2 FROM THE ATMOSPHERE. This is a well-known chemical reaction. Have you ever heard of ACID RAIN? Do you know where it comes from? That's right, GASES in the atmosphere, like CO2, NO2, NO3, SO2, SO3, etc. are absorbed by the rain, and are DEPLETED FROM THE ATMOSPHERE. We know what the equilibrium constants are for water and for CO2. Spraying water into pure CO2 will CREATE A VACUUM as the CO2 is absorbed. If the pool of water that the spray falls into contains Mg or Ca, the CO2 will PRECIPITATE OUT as MgCO3 and CaCO3, otherwise known as "scale". You can see it on your shower head and bathroom faucets and inside of an old water heater. It is also how shellfish create their shells. Yeah, they bubble CO2 through the water and the hard part of the shell forms. Amazing, isn't it? I learned this when I was in 2nd grade, when we all used straws to blow air through sea water in a glass. You can try THAT experiment, too. So anyone who TRIES to say that the CO2 will 'stay in the atmosphere for hundreds of years' and 'only geological stuff will remove it' needs to get a freaking clue. CO2 is AT EQUILIBRIUM. It is EASY TO DEMONSTRATE with SIMPLE EXPERIMENTS. ADDING TONS OF MORE CO2 to the atmosphere will SIMPLY PRECIPITATE IT ALL OUT IN THE OCEAN. 'Nuff said. One area of science that's clearly being ignored by the vast majority of those involved in the debate of whether or not 'Global Warming' is just a natural cycle is ASTRONOMY. But why Astronomy, you ask? It's because of the tidal forces on the sun as caused by the planets and their combined effect on solar output. Recently scientists have ADMITTED that, although sunpsot actiivity has been low, SOLAR OUTPUT in the frequency ranges that matter (i.e. visible light and near infrared) have actually INCREASED, which have then significanlty 'warmed' our earth at a rate above normal. An article at The Register goes into more detail, but instead ADMITS that Mr. Sun may be the cause of the warming trend, and NOT man-made carbon dioxide (as was previously assumed). It also demonstrates how very little many scientists really know about how the sun works. Let us not forget that Mr. Sun is also a bozillian times more powerful than we humans are. I'd put Mr. Sun in the 900 billion pound gorilla category any day, as compared to anything HUMANS could accomplish. So when Mr. Sun gets hot under the collar, so do we. No questions there, except maybe WHY this happens. And I think I have a pretty good idea what might be the cause. Astronomers have recently discovered a large number of planets orbiting stars because of the doppler effects on light emitted by a star due to the presence of planets. Some planets were discovered by shadowing effects, so doppler isn't the only method used. Still, it IS significant because it proves a point: a planet, even though it is 'far away' from a star, still has an effect on that star. 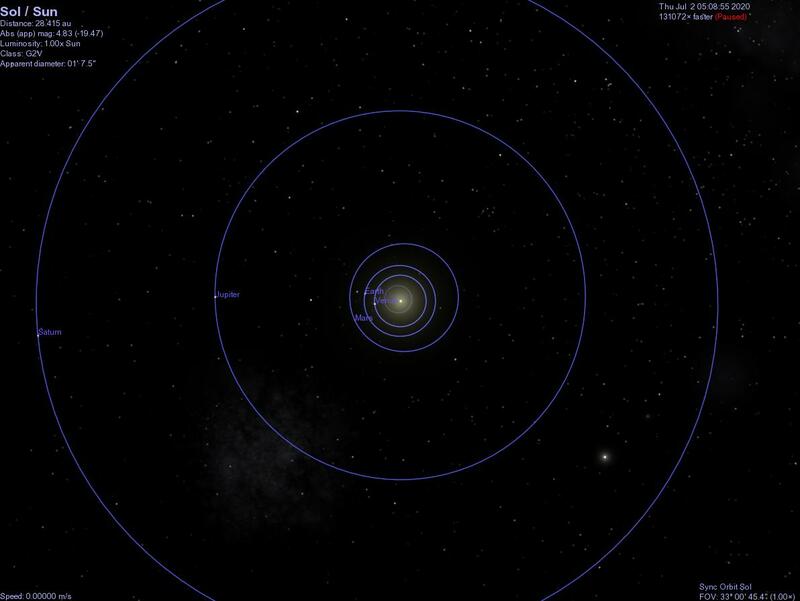 Our solar system has two very large planets, and about every 60 years they'll share the same orbital angle to the sun. It is my presumption that the combined gravitational effects of Jupiter and Saturn cause a significant tidal force on the sun, and this results in a period of time in which solar activity at certain relative orbital angles from Jupiter and Saturn will be higher than normal. This can either cause warmer or cooler weather, depending upon the earth's relative orbital position and season. Tidal effects on earth have been known for millenia, and are easily predicted by the sun's and moon's relative position to the earth. 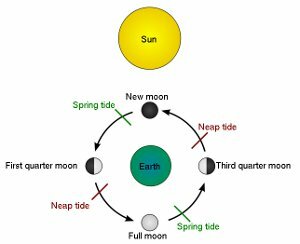 When the sun and moon conjoin or oppose, gravitational effects cause much greater tidal bulges than when they are at 90 degrees to one another, relative to the earth. These are referred to as 'Spring Tides' and 'Neap Tides', respectively. Similarly, the combined gravitational force of Jupiter, Saturn, and possibly other planets (Venus, Mars, and Mercury, specifically) will cause 'tidal bulges' to appear on the sun. The next question is obvious: Do the tidal bulges on the sun affect solar output? I say YES! The probability of a nuclear reaction taking place is the result of several physics parameters, which include the materials involved, their energy level (or 'excitation state'), and the DENSITY of the reactants. In the case of nuclear fission we know that a higher density of fissionable material results in a higher 'reactivity' which allows reactors to be physically smaller and still generate power. In the case of hydrogen fusion (the sun's nuclear reaction) we know that high temperature and pressure are necessary to sustain the reaction. We also know that the sun's internal reactor stabilizes itself between gravity and the outward expansion caused by the fusion reaction in the sun's core. As gravity presses reactants together, reaction rate increases, causing the sun to expand, which lowers the reaction rate. This creates the nice stable nuclear fusion reaction that keeps the sun 'burning' and not exploding. We also know that there are natural variations in the reaction rate, variations which follow measurable periods in time. Not so amazingly, the sunspot cycle is also an indicator of solar output and follows (interestingly enough) an 11 year period, which is close to the orbital period of Jupiter (11.87 years). However, Jupiter alone is probably not the culprit here; it's most likely a combination of planets that is the key to the sunspot cycle. And since inner planets move FASTER, the time between 'relative positions' lining up is going to be slightly less than 11.87 years. In fact, Jupiter and Mars will line up about every 2 years, and Earth and Jupiter about once a year, and both Venus and Mercury more often still. My proposal is that certain positions of Jupiter's orbit, particularly its apogee and perigee, along with the positions of other planets, may have a direct effect on solar output, as evidenced by sunspot cycles. Should this, in fact, be the case, you should see a LOT of evidence that compares solar cycles with planetary positions, especially the apogee and perigee position of Jupiter, and the relative positions of other planets creating tidal bulges on the sun. And it may be that when the tidal effects are the greatest, you have a maximum output. 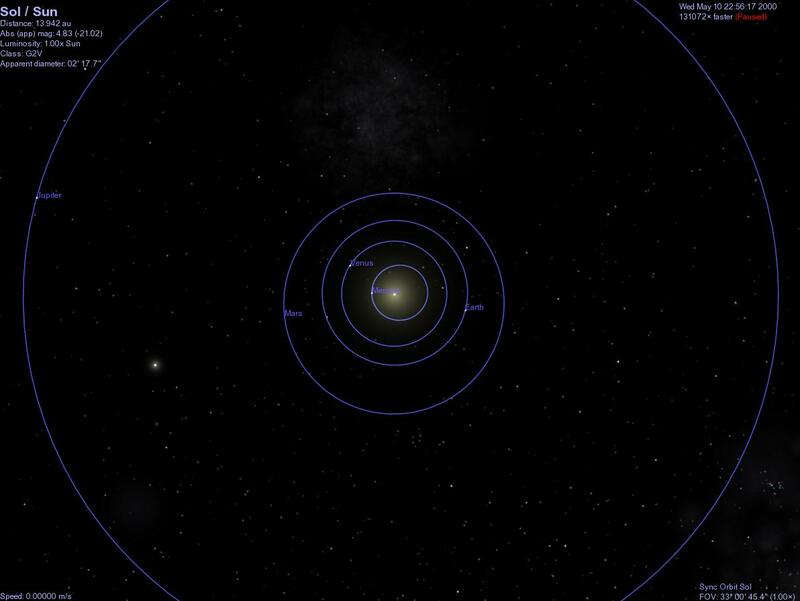 In early May of 2000 there was a major planetary alignment (5 planets + moon as viewed from earth, within 26 degrees of one another) and solar output was at an unusually high maximum as compared to the sunspot level (which was lower than usual during the 11 year sunspot cycle). A nice graphic is available on wikipedia HERE. 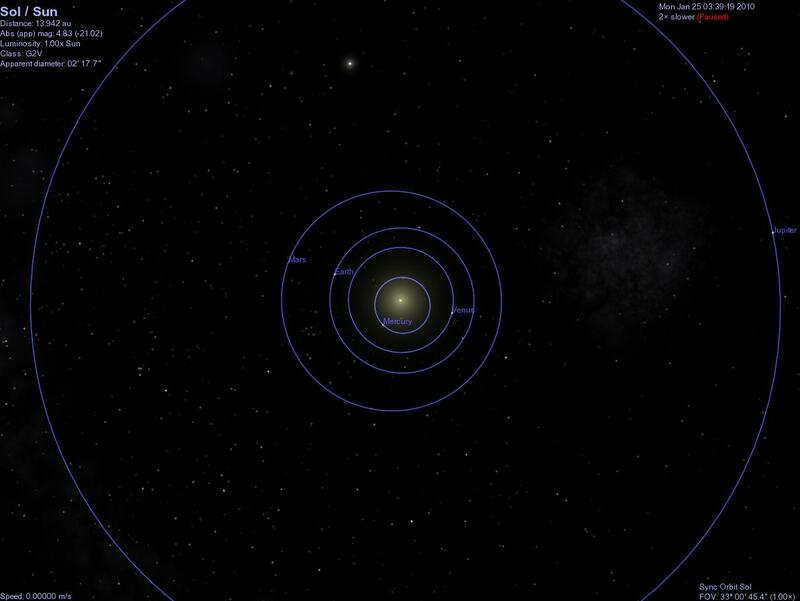 Other planetary alignments have been taking place over the last several years, in what appears to be a much higher frequency than at other times, and it will continue (supposedly there's one in 2012, but I couldn't find it with celestia) for a few more years until the planets happily go about their merry 'unaligned' way. And because of this NATURAL CYCLE, the solar output is higher than usual, and will remain higher than usual for several more years. I used 'celestia' to snapshot a few planetary alignments. These show interesting alignments that are about 10 years apart. Now we can all expect that those in the 'global warming' crowd are going to want to TAKE CREDIT for the obvious cooling pattern that WILL BEGIN within a decade or so, due (as I believe) to the lower frequency of planetary alignments and their relative arrangement to the Earth's apogee and perigee. Those environmentalist wack-jobs (aka man-made global warming fascists) WANT to have all of their ridiculous legislation passed AND ENFORCED for the simple reason that they will want to USE THIS AS "EVIDENCE" that their policied "WORKED" (when in fact it is clearly obvious to those of us with open enough minds that natural cycles are the only thing changing global temperature). So keep in mind that it's 2010 right now when I'm writing this. If what I say is true, you know I said it before it happened, and I used SCIENCE to predict the outcome! Sure, it's a theory, and this is my experiment, to prove or disprove it. We'll just wait and see. Page 4: "Greenhouse gases are a small part of the Earth's atmosphere. However, they are critical to making the planet habitable - keeping the Earth from being a freezing rock in space like Mars." This is purely ridiculous. Mars is a 'freezing' rock because it has a solid planet core, which caused the magnetic field to disappear, and SOLAR WINDS stripped Mars' atmosphere. It is also further from the Sun, so obviously it will be COLDER. On the other side of the planetary spectrum, Venus is a HOTHOUSE because it has SULFURIC ACID in its atmosphere (forming a blanket of clouds), no liquid water, and is SIGNIFICANTLY CLOSER to the Sun. Page 6: "CO2 and other trace gases are only 5 percent of the greenhouse gases in the atmosphere. 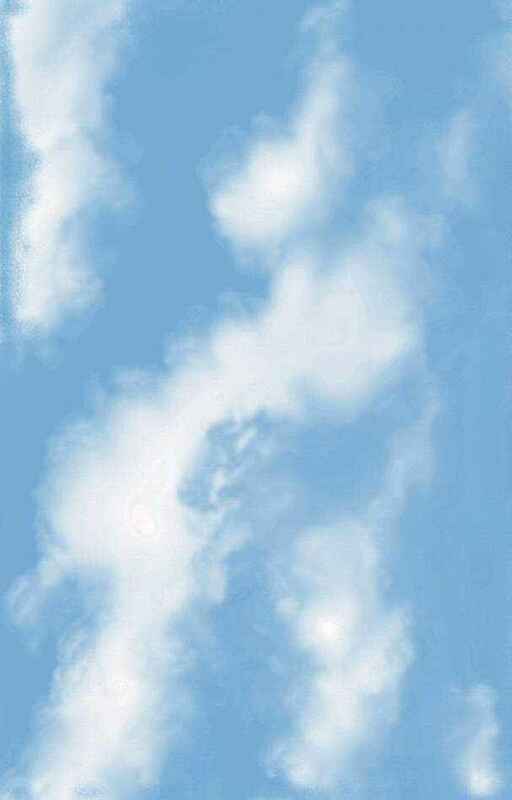 Water vapor makes up the other 95 percent." Not only that, but the infrared absorption spectrum of water (20 times as much of it, don't forget) is at LEAST 10 times more than that of CO2, for an effective delta of (ka-ching) 200 times as much! And water vapor concentration in the atmosphere (say 'humidity') varies radically from one day to the next. Yet our planet's temperature does NOT vary radically from day to day. Go figure. Page 7; "Humans contribute approximately 3.4 percent of annual CO2 emissions." Thank you for admitting this! "However, small increases in annual CO2 emissions, whether from humans or any other source, can lead to a large CO2 accumulation over time because CO2 molecules can remain in the atmosphere for more than a century." WRONG! CO2 is at EQUILIBRIUM with dissolved CO2 in the ocean! So, if CO2 concentration goes UP in the atmosphere, excess CO2 will be stripped out by rain and accumulate as carbonates. If you don't believe me, bubble air through distilled water for a while and then measure its pH. Guess where the acidity came from? You guessed it! The CO2 in the air you bubbled through the water! Rain does the same thing. Page 9: "There was an explosion of life forms 550 million years ago (Cambrian Period), when CO2 levels were 18 times higher than today." With THIS news, I'd be all FOR increasing CO2 concentrations in the atmosphere. Explosion of LIFE! That's a GOOD thing. Page 10: "During the time dinosaurs roamed the Earth, the average temperature was about 18 °F (10 °C) warmer than it is today." These guys are making the case for WANTING global warming. Page 11: "Over long periods of time, there is no close relationship between CO2 levels and temperature." I'm starting to LIKE these guys! Page 13: "For the past 400,000 years, temperature and CO2 levels have varied together. However, the Earth's temperature has consistently risen and fallen hundreds of years prior to increases and declines in CO2 levels." The rising and falling of CO2 levels can easily be explained when you look at equilibrium calculations and the effect of temperature on the solubility of CO2 in the oceans: As temperature rises, CO2 solubility goes DOWN. This causes an increase in measured atmospheric CO2 levels, particularly in the vicinity of volcanos and high geothermal activity. The opposite is also true, so during an ice age you would expect low CO2 levels since more CO2 is kept dissolved in the earth's oceans. Page 14: "During Roman and medieval times, the Earth was as warm as or warmer than it is today. A 'little ice age' began in the 1300s and ended in the mid-1800s." Yes, it DID, Brett! Yes... it... DID! OK, enough of that. Point is, the Earth didn't flood from polar ice caps melting 2000 years ago, and it's not going to NOW, either. Normal cycles happen, can't be controlled by humans, aren't caused by humans, and history PROVES it. Page 15: "CO2 levels have been fairly constant for the last 10,000 years." This is actually quite interesting. Obviously CO2 had NO EFFECT on temperature! But then again, WHERE you take the measurements will affect your results. If you're near UNDERWATER VOLCANIC ACTIVITY, for example, CO2 concentration will be significantly higher. So I beg to differ on the 'nearly constant' part, suggesting that measurements are either inconsistent or misleading due to a data set that does not represent the entire earth. "Largely due to human activities, including the burning of fossil fuels and deforestation,"
"CO2 levels have risen approximately 35 percent since the beginning of the industrial revolution, with more than 80 percent of that rise occurring since 1950." That's strange. If humans only affect 3.4 percent of the CO2 output, how can that POSSIBLY make a change of 80 percent in 60 years? I call <insert profanity> on THIS one. Keep in mind that WHERE you measure is important. Measuring near an area where recent geological activity is causing a 'warm zone' to appear in the oceans (like off of California maybe?) is going to give you skewed results that do not represent the entire Earth as a whole. You need data that accurately represents the normal distributions worldwide, and that would include 'way out in the middle of the ocean' as well on land and along the coastline of a heavily industrialized nation. As we all know, there are lies, there are DAMN lies, and there are statistics. Page 16: "The Earth's average temperature has risen a little less than one degree Celsius over the past century." "Although almost half of this warming occurred before 1940, greenhouse gas emissions began to rise substantially only after the 1950s." This data doesn't CORRELATE very well between CO2 and temperature, DOES IT? Page 19: "Most reports focus on gross CO2 emissions. However, as much as 40 percent of U.S. human CO2 emissions are reabsorbed, primarily by vegetation." And the rest of it? It's in the ocean, of course! Dissolved CO2 becomes carbonates, which will eventually precipitate out if the concentration ever gets too high. You know what LIMESTONE is, right? 'Nuff said. Page 20: "We know very little about 75 percent of the factors that scientists believe influence global temperature." This point needs no further commentary. Page 23: "Many scientists worry that global warming will cause droughts, floods, hurricanes of greater intensity, coastal flooding and the extinction of species that cannot adapt to change. So far, these effects are not evident." Page 24: "Sea levels have risen since the Earth began to come out of the last ice age. However, the rate of sea level rise since 1961, less than two-sixteenths of an inch annually, is far lower than the historic average." Page 30: "CO2 is like plant food and most plants evolved at times when CO2 levels were much higher than today. Laboratory results show that plants grow bigger and faster with increased levels of CO2." Remember, I said this already about 'biological equilibrium' - if you INCREASE the addition rate of CO2 into the atmosphere, plants will GROW FASTER, causing the DEPLETION RATE of CO2 to INCREASE, forming a NEW EQUILIBRIUM LEVEL for both CO2 and plants. It's not the idiotic 'fragile system' idea that environmentalist wack-jobs try to portray, now is it? Page 31: "Most laws and treaties proposed to prevent, reduce or slow global warming would be expensive and do little to prevent warming or future harms. For a fraction of the costs, we could prevent much more harm and benefit many more people by adapting to a warmer world." You ARE encouraged to READ THIS FOR YOURSELF. After much thinking about this issue, I have often considered the possibility that the entire 'Man Made Global Warming' issue exists NOT because the people behind the scenes actually BELIEVE in this pseudo-science, but rather are attempting to bring about some kind of change. Either society itself, or the world's political/economic state isn't what they envision it to be, and they fabricated the 'Man Made Global Warming' issue as a kind of crowbar to throw into the world economic engine in order to make it all happen their way. This makes a LOT of sense if you read between the lines. And there are a number of people who benefit from this kind of thing. There are many good reasons to make changes, and many sinister reasons as well. But it's still the kind of 'manipulation' that only the fearful would do. And above all other reasons, it is most likely FEAR that drives it. The Kyoto Protocol was an obvious ploy into forcing the United States to stop being the economic leader that it has been since World War II. Unfortunately many policies have apparently been enacted to this end, and our current situation as an economic leader is rather tenuous at the moment, all thanks to government policies. There are people out there that believe that LOWERING the United States' economic influence will somehow ELEVATE everyone else. What they fail to see of course is that a rising tide DOES lift ALL boats. They see economics as a zero-sum game where one person 'having' means someone else must 'have not'. But of course this MARXIST idea is just NOT true. Flowing money makes everyone who touches it better off. Oppressing one country, like the United States, will cause WORLDWIDE lowering of economic status, because it causes STAGNATION of the flow of money, and eventually results in a worldwide economic recession (or even depression). Still, there may be OTHER politically based motives, which may actually seem helpful. Right now the entire world is depending upon oil that is being pumped out of the Middle East. And PARTIALLY as a result of all of the money flowing into this region, we have well-funded terrorists committing 'crimes of terror' all over the world. Using 'Man Made Global Warming' as a crowbar into the current energy usage patterns of industrialized nations, you COULD force the invention of other sources of energy (such as hydrogen fusion) as well as the development of electric vehicles that would effectively SHUT OFF THE FLOW OF MONEY to this region of the world. It might be a way to combat terrorism! But if this is the case, WHY LIE ABOUT IT? Lying about something in order to do it 'for our own good' is blatently dishonest, and the KIND of MANIPULATIVE SINISTER BEHAVIOR that 'those in power' have often exhibited for centuries. They deny the fact that people are basically intelligent and tend to make CORRECT choices whenever they are presented with enough information to become INFORMED. Instead, these people whip up frenzy using EMOTION and never really solve anything. Such people must think that everyone else (but them) are idiots. The bottom line is that WHOEVER is behind the 'Man Made Global Warming' facade should simply come forward and state what the agenda REALLY is. If these people truly believe that the results of their agenda is better for everyone in the world, let them address the United Nations and plead their case, and allow questions and commentary and debate to follow. But using EMOTION to displace LOGIC, and 'whipping people up into a frenzy' to cause mass hysteria to drive their agenda forward, is the kind of SINISTER MANIPULATIVE EVIL CORRUPT OVERLORDING that all too often characterizes evil leaders throughout history. Lowering down those who have climbed highest up the ladder of success can only benefit those who are at the very top, and those who are at the very bottom. Those in the middle who are doing their best to get ahead find themselves frustrated by obstacle after obstacle. Having someone tell you that you can NOT climb past a certain rung, and you will be PUNISHED if you try, is only going to create a kind of 'clog' on the ladder. But those at the very bottom (who choose NOT to climb) and those ALREADY at the top, will benefit in several ways, not the least of which is that NOBODY ELSE will reach the top (meaning those already there have MORE power and influence and retain it indefinitely), and those at the bottom get to reap the 'freebies' (wealth re-distribution) that elevates them just enough to keep them from rioting. Still, the ones at the very top benefit the most. They're keeping 'the rest of us' from taking over their exclusive little 'country club', after all. Those who are ALREADY AT THE TOP are sometimes called 'Old Money'. Yes, they're SNOBS. They're like an economic NOBILITY of sorts, and they don't want to lose their inherited power. Those at the bottom are sometimes 'the unfortunate', but usually 'the lazy'. And they're often used by 'Old Money' to further their agenda. It makes you want to feel sorry for those at the bottom, but giving them MORE helps nobody. Freedom helps EVERYBODY. That's what we need to give them: MORE FREEDOM. And the 'Man Made Global Warming' agenda is anything BUT freedom. And I go into a lot MORE HERE. And HERE. Recently I experimented with a 'robotic' movie maker, with what I might call 'ok' results. Originally it was a simple response to a much shorter work (done by someone else) that attempted to make the 'Tea Party' people look like vacuous idiots. I (and others) thought that the concept of 'robot' movies based entirely on text input were good, but the politics were questionable at best. So I decided to make one of my own, having some spare time on Christmas Eve, 2010. I had hoped that it would be a somewhat 'darkly comedic' look at what life would be like in 2014 if the Tea Party elections of 2010 fail to cause reform, and if Obama gets re-elected in 2012 and THEN gets what he REALLY wants. You can view it HERE (flash video). Again, THINK FOR YOURSELF! Please!! !